swissmiss | What is HTML5? This is most informative, thanks for posting it, Tina. I hadn’t really got my head round what HTML5 was before seeing it. I’ve dreamed of building my own iPhone app to do something fun with my illustrations for a while now, and wonder if it may finally be something I can tackle with HTML5. HTML5 allows for arrays of file uploads, so using multiple file uploading as a reason for Flash is incorrect. HTML5 provides so much more than those who’ve only heard of it through Apple’s “demo”, believe. Still, it’s a start I suppose. I would have to say my personal fave celeb is Kendra Wilkinson What do you guys think of her? Kendra is very unusual to me. 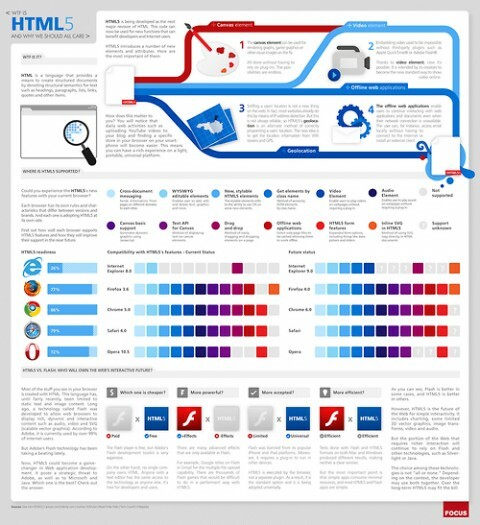 Very good infographic. ! We are linking to this great post on our site. Keep up the great writing.